For the last few days the weather here hasn't been below 100 degree with the heat index and humidity making it feel even hotter. This weeks forecast doesn't show any sign of relief so I am looking for some local inspiration to keep my kids occupied and cool! 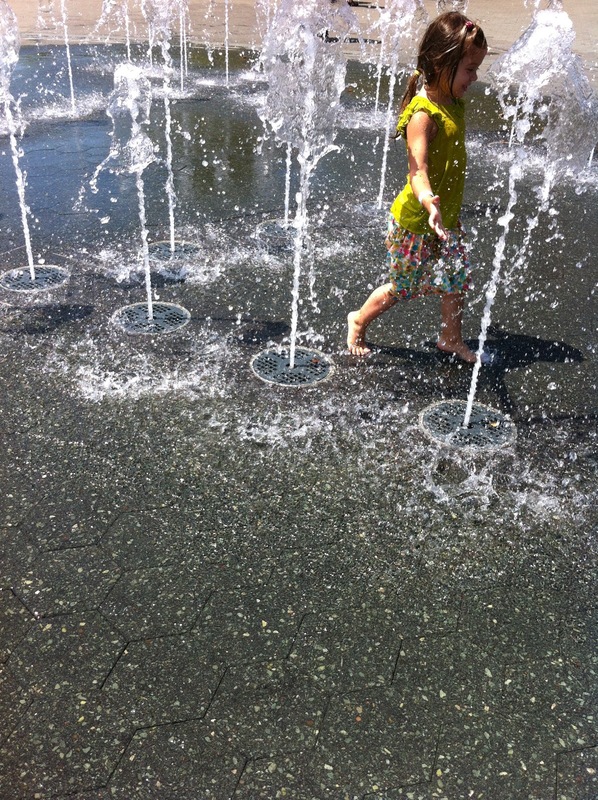 Sondheim Fountain- A great, free and fun way to get wet and cool down. Baltimore Museum of Art Sculpture Garden- This lovely shaded little nook is perfect for getting outside on a hot summers day. Maryland Science Center- If it's too hot to play outside the Science Center has lots of great exhibits for kids including a giant water table! National Aquarium in Baltimore- If you can't go swimming watching some fish swim (while standing in air conditioning) might be the next best thing. Storyville- With two locations to choose from (Woodlawn and Rosedale) Storyville is a fun indoor play place for kids 5 and under. Roosevelt Park Pool- This public pool located in Hampden has a great kids pool and is only a 1.50 for adults and free for kids 3 and under! NCR Trail- Once a railroad line, the NCR trail is now a great place for riding bikes, walking or jogging. The trail starts near Hunt Valley and goes through Monkton all the way to Pennsylvaia. Most of the trail is shaded and runs next to the Gun Powder. Linkwood Playground- One of our favorite playgrounds and not just because it is shady all day long! Port Discovery- If you are looking to climb, run and play inside Port Discovery is a great place to do that and more! Assateague Island- What better way to cool off then a trip to the beach. Irvine Nature Center- When it comes to summer play places outside I am always looking for shade. Irvine has shaded walking trails, a shaded play space and shaded picnic tables. Not to mention some cool interactive kid exhibits in their Nature Center. Stony Run Trail- Another great place for a shaded summer walk, right along the Stony Run creek. Oregon Ridge Beach- What better way to cool down then at the beach and what better then a beach only 15 minutes from Baltimore City! What other places do you like to visit on a hot day in Baltimore?